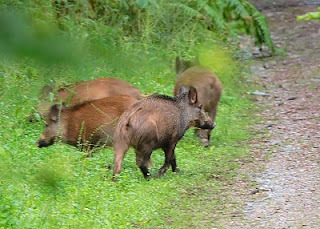 Again, a few comments regarding the wild boars, so I have decided to reply with another post as my comments were rather long. They have been cage trapping them Adrian as well as shooting them, but it is not proving effective enough. They say they need more people on the ground. What I am worried about is that they may hire hunters to help and this could be bad news as we could then start seeing orphaned hoglets. If a feeding sow is killed and there are no other feeding sows in the sounder, the little ones will starve to death as they are dependant on their mums milk for up to 4mths. And I expect this news has already spread, so the poachers will be out in force. Again shooting anything that moves, regardless of whether it is feeding young or no. Wolves: Hah, I would love to hear the cries then. The people around here would probably make up a new nursery rhyme about how you will be eaten if you venture into the woods! Seriously though, the Forest of Dean is not big enough (42 square miles) to re-introduce wolves. After the boars have eaten a few thousand people, then the time will be right to introduce them! Close the area to people who don't like wildlife: Now that's the best answer I have heard in a very long time. You know, there are dozens of other places around here where the wildlife haters can walk their dogs, without seeing anything larger than a rabbit, but they won't, why? They are not prepared to change their routine or their habits for the sake of our wildlife. I know quite a few people who walk their dogs in the forest. Some of them hate the boars, yet still let their dogs run around off-lead. Others love seeing them, but keep their dogs on a retractable lead so they can easily pull them back. Can you see a trend here? I call it respect and without it there will always be problems for some. The recent death of the greyhound was sad, but this type of dog likes to chase things and should not be off the lead where wildlife is. Whether it slipped the lead or no, this dog was out of control – either that or the owner didn’t bother calling it back. It's OK for a dog to chase and sometimes injure wildlife, but when wildlife chases and injures a dog, the owner kicks up holy hell! Employing hunters is very dangerous and not just to the Boar. In an area such as yours it will end up with Deer, dogs and quite possibly people being shot. The only way I can see of controlling them if indeed the time has come to do so is to introduce feeding stations, trap and either nip off their naughty bits or shoot them at close range. It has to be done on concrete and thoroughly cleaned or they won't come back. They tried the feeding station method before, but this was when the numbers were low and people were fearing a total cull. There are still quite a few people out there that believe the boars should be left alone and not managed full stop. These people need to get in the real world and start realising that a prolific breeder like the wild boar (with no natural predators), "WILL" breed out of control and we will then have more serious matters to deal with. Thanks for your input Adrian - Appreciated. Rob it does worry me. Townies and livestock don't mix. As you know I'm encumbered with two young terriers. We mix with cattle, sheep, horses and in Derbyshire only last week with Boar. They are kept on a lead........Always if other livestock are about and from April until the middle of August when one assumes ground nesters have finished breeding. Makes me wonder who even had a lurcher/ Greyhound off the lead, hunts don't do it with hounds,in breeding season, it just took on something better than itself. The owner needs prosecuting by the RSPCA for causing unnecessary suffering. Anybody thought of reporting them? Ignorance is no defence. What I dread is a young child cornering one. The whole lot would then go. Have they tried darting them? Again you have to be close and that means good. Keep up the crusade, you have more stamina than I have and the very best of luck. Thanks Adrian. I just hope the FC get it right and the locals give them a chance. After the boars were hunted to extinction during the 13th century, at least 4 attempts were made to re-introduce them. They all failed because the boars were not given enough time to get re-established. We have wolves in Idaho and it is always a hot topic and debate. The fairy tales and disinformation abound....I am always amazed at the trash people believe. The big game animals are healthier because wolves cull the herds. Our ecosystems are healthier because the herbivores are kept on the move by wolves and they don't get a chance to overgraze areas for the most part. Except for domestic cattle..but thats another story. I think your 42 square miles is not to small of an area for wolves...what the hay! Thanks for your comment Rich, very valid points and its always interesting to know what is going on in other parts of the world, where our wildlife is concerned. Certain people around here would be able to co-exist with wildlife such as the wolf, as we are able to make sacrifices, and look for solutions to potential problems before they became major issues. It was recently reported that the wild boar got into a local arboretum here and rooted up all the grass. I wonder how many people, including the FC were waiting for this to happen and did nothing about it. It’s so easy to wait for something to happen and then use the wildlife as a scapegoat, rather than do something about it to stop it happening in the first place! I see the rooting and feel good that the boars are still around, the ground repairs itself over time and it is actually good for the soil. Sadly there are too many people who do not think like this and see the forest as theirs, to do whatever they please! To all these people I’ve only one thing to say….. The wolf will never roam the Forest of Dean as a free animal. Not in my lifetime anyway. Great response, Rob. I call to mind the phrase "when in Rome, be a roman candle" - when you're in an area of wildlife, behave as the people who live and work there do. Respect for your current surroundings has to be the order of the day. I am well chuffed with all the positive comments regarding the wild boar. I would also respect negative views as I know they are also valid and it is crucial for me to have a balanced approach if my views are to hold any sustenance. Speak out. You are doing a good job. There are very few voices out there. Your Boar were stupid, they trusted people and came out in the daylight. In East Sussex our Boar are smart. Local people hardly know that they are here and certainly don't know their numbers. They are nocturnal and distrusting of people. Outlaws. That is what will happen to your Boar and they will survive. In woodland I keep my German Shepherd on a lead. Not to protect him from the Boar but because I do not want him stressing any wildlife. I have trained him to kill tennis balls and I run him in the park. The FC wont win this one. Thanks for thinking of me N-ID. Great shots there, I gotta get me one of those cameras!